It is already a long time ago that I wrote a blog about streaming data with the ELK stack. Today you see a lot of the so called “no code” solutions. You need only some configurations and that’s it! In this blog I use Microsoft Flow and Microsoft Power BI with the focus on streaming data. Suppose we want to create a twitter stream about a live soccer match, we can make a twitter flow in Microsoft Flow (and do a sentiment analyse on the tweet text) and finally create an action to a Power BI API stream endpoint. We need some extra time dimension fields month, day, hour and minute to use drill/down features later on in Power BI. The outcome of the sentiment analyse on the tweet text will be placed in the field ‘score’. From 0 to 1 is from more negative to more positive. Power BI show the following field formats. Power BI makes a JSON like format (a REST Webservice on the background). Switch ‘historical data’ to ‘on’, if you will save the data for analysis later in time. You only can access those (historical) dataset with Power BI Desktop if this switch is ‘on’. Now we go to Microsoft Flow https://flow.microsoft.com. Login (otherwise sign up for a new account) and ‘create a new flow from blank’. Find the trigger ‘When a new tweet is posted’. Enter a <hashtag>, you can also use boolean operators like ‘AND’ or ‘OR’. In the next step we add a new action. 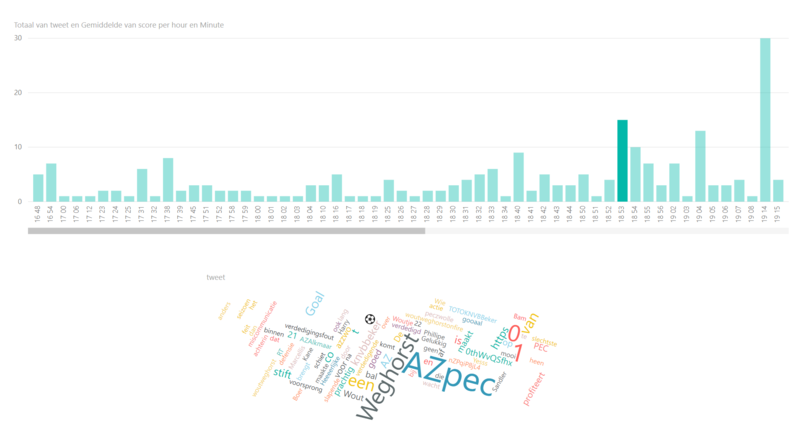 Use the search word ‘sentiment’ and the connector ‘Text Analytics – Detect Sentiment’. Choose the ‘Tweet text’ field to fill the Text field. Now enter the last step and add the last action to connect to Power BI. Search for ‘power bi’ in the search box and choose the Power BI connector. Fill in the workspace ‘My Workspace’ and fill in the name of the streaming dataset you give in Power BI earlier. The table field is filled with ‘RealTimeData’. If everything is complete you see the above picture. The twitter fields and the score field of the sentiment analysis is clear. For the time fields we use expressions (I live in the timezone UTC+1). I started my flow on the 31 January 2018 around 17:00 (the start of the match was 18:30) and I used the match AZ against PEC Zwolle (hashtag #azpec) in the quarter final of the KNVB beker. Below some nice charts that I have made in Power BI. On this charts you see the number of tweets per minute. I also use the Wordcloud chart, that you can import from the marketplace. When you press the minute bar on 18:53, you can see that Wordcloud collect all the words of the tweets that are send on minute 18:53 and we see clearly that Wout Weghorst makes the first goal! On this chart you can see that the average sentiment around Alkmaar the home place of AZ is more positive, than the rest of the country. There are some things that can be better and maybe the Microsoft Power BI team can make this happen in one of the monthly Power BI updates. The number of charts are limited when you use the real-time dash board of Power BI. In this blog I collect the data first to use the power of all the available charts. You cannot add or enrich more data to a Power BI stream. For example I want to add a time dimension (as a new relation/table) to the streaming data set.